For writers, literary inheritance is inexorable. Many suppress, some overcome, and a great deal are burdened by what Harold Bloom called the “anxiety of influence.” The writers who transcend their inheritance might allude to their precursors, tip their cap, and maybe even insert a line or two from the master into their work as a sign of respect. But contemporary Spanish authors have taken a different approach. Refusing to settle for polite allusion, they instead dig up the masters and plop them into their narratives. Take Carlos Rojas’s The Ingenious Gentleman and Poet Federico García Lorca Ascends to Hell, where the Garcia Lorca sits in hell watching his life acted out on stage. In The Savage Detectives, Roberto Bolaño’s itinerant characters embark on a quest for their literary gods. Enrique Vila-Matas’s novels pathologize literary influence; characters succumb to literary diseases (Montano’s Malady) and enter Hemingway lookalike contests. 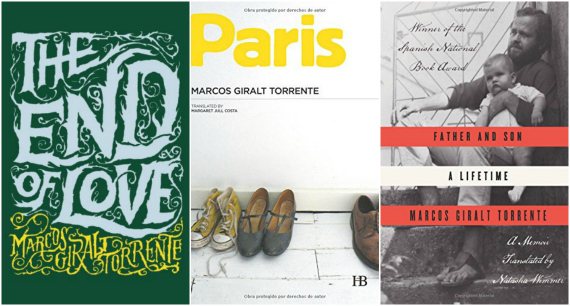 So it’s no surprise that Spain would produce Marcos Giralt Torrente, a writer fixated on influence and inheritance. Giralt Torrente is already well-respected in Spain, where he has won the Herralde Novel Prize and the Spanish National Book Award, but his name will be fairly new for most English readers. In the past year alone three of his books—the story collection, The End of Love, a novel, Paris, and his memoir, Father and Son: A Lifetime—have been published as English translations. Giralt Torrente is the son of painter Juan Giralt and the maternal grandson of esteemed Spanish novelist, Gonzalo Torrente Ballester. He would seem, therefore, the perfect candidate to carry the torch of his contemporaries. And yet, Giralt Torrente is less concerned with literary influence than he is with familial influence, the inheritance that haunts the person regardless of whether the author emerges. His memories, so thoroughly contaminated by her, cannot be trusted. Yet memory remains “a great temptation.” Tempting and addictive. A burden for those who seek comfort, for to remember is to struggle, to disentangle received narratives, reorder them, in a fruitless attempt to uncover the truth. Not big T truth—though that’s all over Paris—but the basic truth, what happened and why. And what’s marvelous about Paris is that, despite its relative lack of action, the novel holds our attention, as we, too, read to uncover what happened. This is partly due to Giralt Torrente’s careful plotting, and partly due to a swaddling, syntactical empathy. When we think about the past, it’s hard to resist both dividing it up into blocks in accordance with the pattern of events that have made the most impression on us and attributing powers to it that it does not have, allowing ourselves to believe that the arrival of a particular date had the ability to work some radical transformation on us. Until the death of my father, we say, I was like this or like that, when we should really say that on such and such a date, something that had already existed inside us began to make itself manifest or visible. To borrow from William Gass, these sentences “contrive (through order, meaning, sound, and rhythm) a moving unity of fact and feeling.” As we read we think with the narrator thinking through the idea. The statement is felt rather than proven. And the use of the first person plural conflates narrator and readers. But there is a difference between Giralt Torrente’s use of the first person plural, and Javier Marias’s, who uses this technique quite often. In Marias “we” is broad and inclusive, sweeping through Madrid and Oxford, while in Giralt Torrente the “we” is restrictive, limited to his characters and his readers. We feel caught in the narrator’s mind, hearing it obsessively reassess, which is perhaps most reminiscent of Bernhard, where each sentence seals off the world like Montresor stacking the bricks in our tomb. Inheritance, for Giralt Torrente, is not strictly filial, but existential. The relationship between father and son in Father and Son, lets him explore personhood more broadly. The search for where they got stuck is inseparable from the search for identity. Was stubbornness to blame? Competiveness? And if they share those traits shouldn’t the son be let off the hook? How relieving it is to trace our most toxic traits to our parents. Inheritance is expiation—but it’s also original sin. Giralt Torrente’s work suggests character is inherent and untraceable. Discovering the seed of ourselves is as easy as pinching hydrogen atoms out of a river. Perhaps this is why we often concede to our selfhood. As Giralt Torrente writes in Paris, our character “depends not on the appearance or disappearance of new characteristics but rather on the way in which certain already-existing characteristics win out over others.” To refuse to accept yourself is to grasp with irritable, buttery fingers. So we pivot to the question of when. Not when we became who we are—the narrator in Paris rightly debunks that search—but the discernible when: the choice that made everything different, the instant we acted a certain way and thus cemented the future. These are the moments that plague conspiracy theorists, jilted lovers, and armchair quarterbacks. In The End of Love, Giralt Torrente’s story collection, many characters obsess over such moments. The speaker in “We Were Surrounded by Palm Trees,” reflecting on the final days of his relationship, says, “one of memory’s most powerful tendencies is to identify those moments when it would still have been possible to change the course of events.” He has been seduced by this moment. Memory loves to convince us we’re free, in control. It fills our heads with revisions, the house we might’ve owned, lovers we could’ve loved, jobs that would’ve fully inspired us, if only we’d kept playing piano or told Chris how he felt. But choice, for Giralt Torrente, is an illusion. Had the narrator in acted differently, he may have lengthened his relationship, but he would not have saved it. The will, here, exists, but it is in no way free. It is free the way dogs at the kennel are free to bark as loud as they like. To fully understand one’s desires is to see the discord between what is desired and what is obtained. In Father and Son, this is expressed in extended passages of longing—“I liked it when he considered me an equal . . . I liked to match his dilettantish hedonism . . . I liked to invade his territory . . . I wanted to learn, to be like him, and I imitated him”—which are repeatedly undercut: “But I hardly ever succeeded. I lacked so much of the knowledge I know he possessed. We squandered so many opportunities.” This is not simply weltschmerz. It is a further expression of Giralt Torrente’s somewhat Aristotelian conception of personhood: people do not change, they merely reach their inherent potential. Giralt Torrente is, in other words, a fatalist resistant to fatalism. He isn’t trying to teach his characters lessons. He doesn’t think they are wrong for trying to pinpoint the moments when life changes, when personalities shift, but the ordeal is never successful. Giralt Torrente empathizes with the futile attempt to fully understand who we are. In Father and Son, death reminds him that “everything comes to an end, that there’s no redemption, that what wasn’t done can no longer be done.” Such a bleak realization, learned in life but expressed in the memoir, suggests that Giralt Torrente, knowing there is no redemption, still writes the memoir that strives to redeem its subjects. There is nothing sensational, no gimmicks or zany protagonists, in Giralt Torrente’s fiction. The influence of Henry James is apparent. Giralt Torrente writing feels classically devoted to storytelling. His books are haunting, complex, and engrossing, peopled with well-developed, flawed characters that are obsessive and voluble, yet Giralt Torrente, for all the freedom he gives them to speak, never cedes control of his stories. One pleasure of reading his work is unlocking their structures, seeing time subtly manipulated, seeing what the characters do not, and may never, understand. His books are charged and evocative, loaded with precise, intelligent sentences that create worlds that are easy to enter and impossible to escape. Alex McElroy 's work appears or is forthcoming in Indiana Review, Gulf Coast, Diagram, Tin House, McSweeney's Internet Tendency, ProQuest, and more work can be found here. He currently lives in Arizona, where he serves as the International Editor for Hayden's Ferry Review. What fascinates me as both reader and writer (and also as teacher and lifelong writing student) is the always dynamic tri-level experience of delving into these works and their like; one is always simultaneously aware of 1) the author’s particular knowledge of and relationship (intellectual, political, emotional) to the real-life material; 2) one’s own particular knowledge of and relationship to (or lack thereof) the material; and 3) one’s engagement/response to 1). Where has the author stayed close to “facts,” and where has she taken liberties of imagination, supposition, projection? Does my experience of the novel grow more, or less, deep and interesting as I identify the fact-fiction seams? Personally, I would say more – which is to say that, as we see the way in which researched and imagined history braid together, the author himself ultimately becomes a compelling character in his own right. As the author decides what to imagine/suppose/project (and of course how), he reveals, inevitably, his own concerns, ideas, obsessions. What is it about the German romantic poet Novalis’s rather banal, albeit eccentric, middle-class family and upbringing, and his courtship of the dull-witted 13 year-old Sophie von Kühn – years before he came into his full powers as poet and philosopher – that captivated Penelope Fitzgerald’s literary imagination? By what instinct or logic did both Susan Choi and Somerset Maugham take liberties in renaming their characters and revising their stories, while also rendering them clearly recognizable to the reader (as Paul Gauguin, and Patty Hearst and Wendy Yoshimura, respectively)? What do Bolaño and Le Guin mean by backgrounding primary figures like Borges and Cortazar, and the Arctic explorer Roald Amundsen, while foregrounding peripheral, fictional protagonists (the novelist Sensini in the story of the same name, and the all-female exploration team in “Sur”) in their stories of literary greatness and extreme adventure? Similarly, how important in the scope of history are figures like J.P. Morgan, Henry Ford, and Freud – in Doctorow’s literary vision – relative to a minor ragtime musician (the fictional Coalhouse Walker, Jr.), the Vaudeville escape artist Harry Houdini, and an immigrant street artist (also fictional), given Morgan’s and Ford’s relatively peripheral (at the same time utterly fascinating) scenes in Ragtime? What do Walbert’s imagined depictions of suffragette Dorothy Trevor Townsend’s female descendants tell us about her “what if” thought process (i.e., what if your mother, grandmother, great grandmother starved herself to death for a cause?) and conceptions of emotional inheritance? In other words, in their particular, idiosyncratic manipulations of history and imagination, and through our careful study of the results, these authors show us glimpses of not only their characters’ but also their own inner moral landscapes. How we read these works also reveals to us something about our own relationship to fact and fiction. To what degree am I aware of divergences from strict facts as I am reading? Do I give myself over to the whole of the created world and characters, or do I pause to ask myself, “Did this really happen?” and then click over to Google to fact-check? Or do I engage in this research afterwards? Or not at all? Why, or why not? We read a memoir, a la James Frey’s A Million Little Pieces, and take it for true, only to learn that key elements have been fabricated, embellished. We are offended, insulted, maybe impressed, maybe not so surprised. But what of the converse? You are reading an absurd or incredible scene in a novel (the episode in Ragtime where J.P. Morgan sleeps solitary in the crypt of an Egyptian pyramid comes to mind), and then come to find it really happened. What is the effect, then? The other day I was walking in the park and saw, in a pond, a bronze sculpture of a turtle, nose in the air, perched on a rock. How quaint, I thought. Then, movement in the water: an actual turtle swimming, nosing up to the sculpture, trying to get its attention. Silly, dumb thing, I thought. Then, the sculpture’s eyes – black on white with blood-red outlines – suddenly flickered; the turtle stretched its neck even longer up toward the sun, then twisted to acknowledge its suitor-compadre. I stood there a few moments, smiling stupidly. What was the nature of my delight? The translucent hologram of truth and falsity, real and fake, shifting and melding, captivates. In the hands of a skillful and mindful artist, the effect is unsettling and exciting: we start out on a smooth, hard path, but then find our feet sinking into warm sand, or slipping on ice, at times finding again stone-solid footing, only to slip or sink again. Where are we? Whose reality is this? History, the author’s inventiveness and fixations, our own projections and obsessions call out to us all at once. In historical fiction, studied closely, perhaps more so than with other sub-genres, this motional holographic magic comes into stark relief – not unlike the red flickering eyes of a turtle or, one hopes, the un-dotty aha moments of a seminar-class discussion. For good measure, maybe I’ll show up on the first day wearing gold lamé and skinny jeans. They try to form a band, they do drugs, they light themselves on fire, they fall off roofs. It's all so New Jersey. Suddenly, every time I walked into a bookstore or read a review, I started noticing similarly breathless subtitles. What had struck me initially as the odd unfortunate decision now began to look like a full-blown trend. My first response to the new edition was to wonder whether it was an attempt to steer readers away from the unsavory aspects of the novel, a trigger warning-age sanding down of edges. In my class, the only acceptable genre was the one I had learned to associate with so-called serious fiction: sad middle-aged men trying to reclaim their youthful glory, preferably while drunk on cheap whiskey.